Posted by Pastor Mike on Aug 22, 2016 in Blog | Comments Off on Are You a Cultural Christian? Can you define faith? Not the easiest thing to explain to another person, is it? The closest thing to a Bible definition of faith is found in Hebrews 11:1: “Now faith is the substance of things hoped for, the evidence of things not seen.” I bet that cleared up the whole question for you, right? Honestly, faith remains puzzling for many people. As a result, we often wonder in our hearts whether we have any faith at all (or at least the right kind). Paul was a prisoner on board a ship headed for Rome. But that ship was being battered by a storm. It seemed that none of the 276 passengers would survive the voyage. After 14 days, it looked as if they would be swallowed up by the sea. But then God spoke by an angel to His servant Paul. KJV Acts 27:24 Saying, Fear not, Paul; thou must be brought before Caesar: and, lo, God hath given thee all them that sail with thee. 25 Wherefore, sirs, be of good cheer: for I believe God, that it shall be even as it was told me. Notice Paul’s conclusion: “I believe God, that it shall be even as it was told me.” Did you catch it? Paul just defined faith for you. Faith is believing that what God tells me is true. Are you taking what God says to be true? What about His word to remember your sins no more (Heb. 8:12)? What about His word not to leave you (Matt. 28:20)? What about His word that He cares for you (1 Pet. 5:7)? What about His word to meet all your needs (Phil. 4:13)? Faith may still hold some mysteries, but this is a great place to start: believe what God says is so! You probably haven’t given a second thought today to those two highly skilled instruments affixed to the end of your arms! I’m talking about your hands. Yet, how helpless I would be without them. They go with me everywhere . . . and it’s a good thing because I am in need of them constantly. I need them to scratch an itch, to eat my meals, to tidy my house, to complete my daily work, etc. They come in “handy” all the time. There’s another hand, I couldn’t live without. It’s the hand of God. When Ezra and Nehemiah were trying to explain how things just seemed to be “working out” in their lives, they attributed it to God’s hand on them. KJV Nehemiah 2:18 Then I told them of the hand of my God which was good upon me; . . .
KJV Ezra 8:22 . . . The hand of our God is upon all them for good that seek him; but his power and his wrath is against all them that forsake him. This hand was not just for them. As Ezra said, it is for all them that seek Him. That means if you are a Bible Christian, a set of hands go with you everywhere you go, preparing the way before you, protecting you from harm, and helping you in a hundred other ways you probably never even realize. If you have a good day, remember the Hand that made it possible. Our Spring sessions are already underway. Books are available for each group for personal study. The sessions allow for interaction and comment on what has been learned. You are welcome to jump in at any time! In September, the Ladies’ group began a study of the book of Job with the “Workmen of the Word” Series by Linda Lindley. Men are studying A Praying Life by Paul Miller. 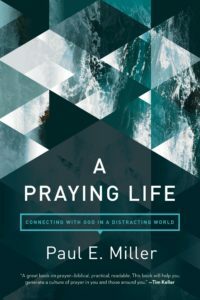 Miller shows us how to connect with the Father even through “messy” prayers. Join us for this encouragement to engage your Father through prayer.